Deploy and Re-deploy a web part solution package (.wsp) using STSADM command. Deploying a web part solution to the SharePoint using STSADM is an easy task, everyone knows about it. But while developing a web part, sometimes we need to re-deploy the solution again and again. In this case we cannot simply re-deploy the solutions and we have to follow some additional steps to redeploy again. There are several ways to create the solution file, but I have used the WSPBuilder to create this web part solution. You can see this in my previous post. There are 2 steps to deploy a solution using stsadm. Add solution – Add a solution file to the solution store. See more details here. Deploy solution – Deploys files related to a solution from the configuration database to individual front-end Web servers in the farm. See more details here. We need one more command to Executes all administrative timer jobs immediately instead of waiting for the timer job to run. See more details here. Please note: The name and filename in the above commands, if it is filename we have to use full file path. Retract solution: Retracts the specified solution’s deployment which removes files from the front-end Web server. This is actually reversing the deployment. See more details here. Delete solution:Removes a solution file (package) from the solution store. See more details here. Step 4: Re-deploy the solution again, for this follow the steps 1 to 3 in the Deploy! 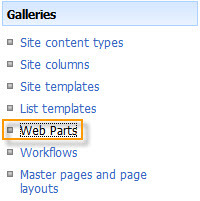 Step 5: Web part will be showing on the web part gallery. Step 9: The web part will be shown on your page. 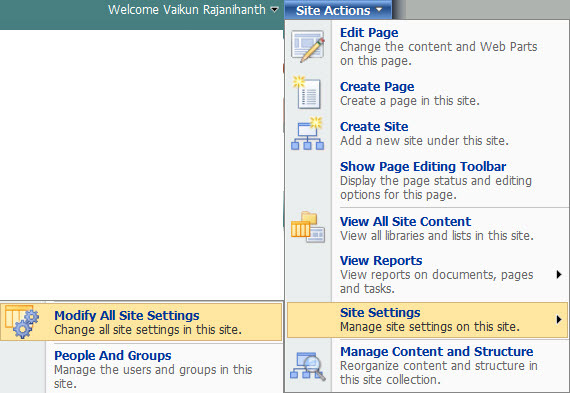 Step 10: If you want modify the appearance and layout then Click Publish. Step 11: That’s all, we are done. You are currently browsing the archives for the STSADM category.